Rejuvenis B12 Spray combines 1000 mcg Vitamin B12 with the active form of vitamin B6 and folic acid in an easy to use spray. Suggested Use: As a dietary supplement, hold nozzle 1” from mouth. Spray once and swallow. Use once daily or as directed by your Healthcare practitioner. Shake well before each use. Rejuvenis B-12 Complex Spray is a dietary supplement that helps support energy as well as healthy blood and nerve cells. Vitamin B-12 in plasma is in the methylcobalamin form. 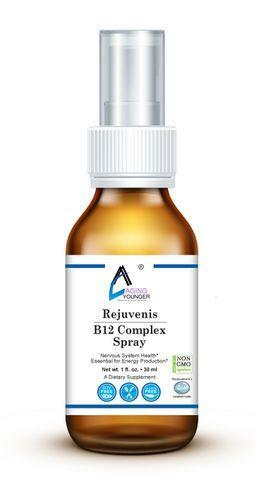 Methylcobalamin is the active form in Rejuvenis B-12 Spray. Liquid form of B-12 is absorbed through the mouth thus by-passing the need for the intrinsic factor in the stomach. This is especially important for the elderly as the intrinsic factor declines with age. B-12 also benefits vegetarians who are often deficient due to dietary inadequacy since B-12 is present in natural form only in animal sources of food. However, vegans are not the only ones who can become vitamin B-12 deficient. Framingham trial studies have shown that at least one in 4 Americans are deficient of this vital nutrient and almost half of the population has sub-optimal levels. Take 1 Spray under the tounge daily. The older you get the more your digestive system breaks down, especially if you have been following the standard American diet. B-12 is bound to the protein in food. During the process of digestion, hydrochloric acid in the stomach releases the B-12 from food proteins and then it is combined with a substance called Intrinsic Factor which allows for the absorption in the intestinal tract. The main cause of vitamin B-12 deficiency is what term researchers call food-cobalamin malabsorption syndrome. Cobalamin is the scientific term for vitamin B-12. This typically results when your stomach lining loses its ability to produce intrinsic factor which is a protein that binds to vitamin B-12 and allows your body to absorb it at the end of your small intestine. Rejuvenis B-12 Complex Spray is a water soluble vitamin with a key role in the normal functioning of the brain and nervous system, and for the formation of blood. It is one of the eight B vitamins. It is normally involved in the metabolism of every cell of the human body, especially affecting DNA synthesis and regulation, but also fatty acid synthesis and energy production. As the largest and most structurally complicated vitamin, it can be produced industrially only through bacterial fermentation-synthesis. Vitamin B-12 was discovered from its relationship to the disease pernicious anemia, which is an autoimmune disease that destroys parietal cells in the stomach that secrete intrinsic factor. As stated, Intrinsic factor is crucial for the normal absorption of B-12, so a lack of intrinsic factor, as seen in pernicious anemia, causes a vitamin B-12 deficiency. Many other subtler kinds of vitamin B-12 deficiency and their biochemical effects have since been elucidated.